Clear Lake, Iowa, USA is a shallow, agriculturally eutrophic lake that has changed drastically over the past century. Eight macrophyte surveys since 1896 were pooled and examined to characterize long-term impacts of eutrophication on macrophyte community composition and relative abundance. Surveys in 1981 and 2000 revealed few submergent and floating-leaved species and a dominance in emergent species (Scirpus, Typha). Over the past century, however, species richness has declined from a high of 30 species in 1951 to 12 found today, while the community composition has shifted from submergent-(99%) to emergent-dominated floras (84%). Potamogeton praelongus was the first emergent species to disappear but was followed by several other clear water Potamogeton species. Several floating leaved and emergent genera increased in relative abundance with eutrophication, notably Nuphar, Nymphaea, Phragmites, Polygonum, Sagittaria, Scirpus, and Typha. P. pectinatus was present over the entire century due to its tolerance of eutrophic conditions. Macrophyte growth was generally light-limited, with 93% of the variance in relative abundance of submergent species explained by changes in water transparency. Clear Lake exhibits signs of alternative stable states, oscillating between clear and turbid water, coupled with high and low submerged species relative abundance. The maximum macrophyte richness occurred as the lake oscillated between submergent- and emergent-dominated states. Changes in the water level have also impacted macrophyte growth since the area of the lake occupied by emergent macrophytes was negatively correlated with water level. 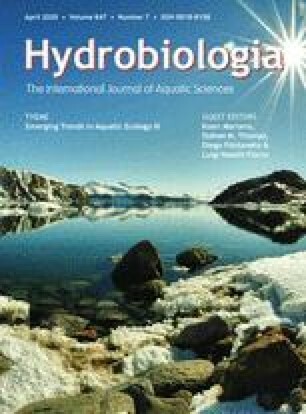 Strongest correlations indicated that macrophytes respond to water level variations with a 2-year time-lag.